True, there were those who hoped, a few stifled an instinctive inclination and one or two were willing to believe, rarely publicly for fear of the subsequent denouement of their opinion, but on the whole the consensus among the great and good of the boxing reportage was – ‘Fury is out of his depth.’ It was the obvious patter. In a nation of free speech, in a technological age where everyone has a platform to air theirs, the adage, opinions are like arseholes, i.e. everybody has one, has never been more true. It is, therefore, depressing how frequently they are arrived at as a subconscious collective rather than as a qualified individual perspective. There was an inherent laziness, in the dismissal of Tyson Fury’s challenge to Wladimir Klitschko and a willingness to embrace the Ukrainian’s longevity as sufficient evidence of his greatness. Whatever the thought process of those who reached this conclusion, it betrayed the experience and resources of those delivering the message. I’ve always extended sympathy to the lack of challenge the heavyweight division has offered the urbane former champion, you can only beat what is in front of you after all, but any appraisal of his qualities cannot rate him among the greats of the heavyweight lineage. On quantitative measure Wladimir may well match or surpass Joe Louis or Larry Holmes for longevity, be taller and heavier than Dempsey, Marciano and Iron Mike and have filled arenas in a way even Ali an Johnson would have envied. But on the qualitative measures of speed, skill, movement, chin, power, determination…….he falls way below those illustrious names. Contextualising Tyson’s achievement becomes hard to do against this more modest index; I’m loathed to underestimate it for the joy he brought me in proving my own theory Klitschko junior was entirely beatable but equally cautious to over-state it too. For every ounce of pre-fight gravitas afforded him, there is the reality of Wladimir’s approaching 40th birthday and the shadows of Sanders and Brewster still subduing the shine applied by the revisionists who manicured his repute, not to mention a limited Samuel Peter sending him sprawling, though in defeat, more than once. Facts often over looked in the pre-amble to the weekend; the default marketing package ‘Fury the massive underdog, Klitschko an all-time great’ proved irresistible. However, Tyson, as in so many facets of his life, wasn’t reading that script. He wouldn’t act like the gutsy, no-hoper. He wouldn’t do it for Klitschko, for whom challengers have often adopted a ‘grateful to be here, where is the cheque and the canvas?’ mantra, and he wouldn’t do it for the press. It led to a dislocation in the promotion’s narrative, it was the crucible for the unnerving of the champion but it still didn’t encourage the assembled sports press to consider the true merits of the two fighters. To use their eyes and look beyond the aesthetics. 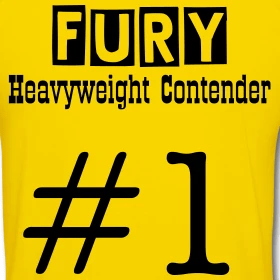 In the aftermath, the Fury camp tried to provide a comparison of Tyson’s achievement, to help offer the press a short-hand quote to persuade the masses. They believe it to be the “greatest heavyweight upset since Ali (or Cassius Clay as he was in victory) defeating Sonny Liston”, himself a venerable, if ill-defined, age at the time. A comparison which leaps past Tyson and Buster, as it should, for that will likely never be surpassed. For me, excusing the huge variance in weight and styles of the protagonists, it possesses something of the Hatton v Tszyu, or perhaps even McGuigan v Pedroza. The former name checked by Tyson himself. Both fights pitted younger, fresher challengers with self-belief and the perfect style for the task in hand against veteran champions at the end of long reigns. The difference last Saturday of course, was this particular victory was recorded where every other advantage was afforded the champion and amid the heavyweights, where the story will always reach further. Whatever the merits of the victory in an historical context there is a new dawn in the heavyweight division. And as a long time critic of the Klitschko brothers, despite respecting the deportment with which they’ve held the titles, my interest in the sport is renewed. Tyson Fury can do that. If you are willing to look.